It would have been hard to miss the deluge that washed over the country this past week. Otago and Canterbury were particularly affected, with flood damage in Waitaki District estimated at about $1 million. Minor flooding also occurred around Christchurch, with the lower reaches of the Avon, Heathcote and Styx Rivers overflowing their banks. To put these high Christchurch flows into context, on late Tuesday afternoon I drove out to two flow gauging sites on the Heathcote River, one at Ferniehurst St (managed by Christchurch City Council) and one downstream at Buxton Tce (managed by Environment Canterbury and Christchurch City Council) and filmed the flows. See the footage below (top = Ferniehurst; bottom = Buxton). In many places, the water levels reached just shy of the top of the bank or beyond; a portion of the road near Buxton Tce had been flooded. There’s some background material on Heathcote River flooding here. The river continued to rise until about 9 pm, when it surpassed 8000 L/s at the Ferniehurst site and nearly reached 20000 L/s at the Buxton site. During the 28 seconds I was filming at Buxton, almost eight 40-foot shipping containers’ worth of water passed under the footbridge. 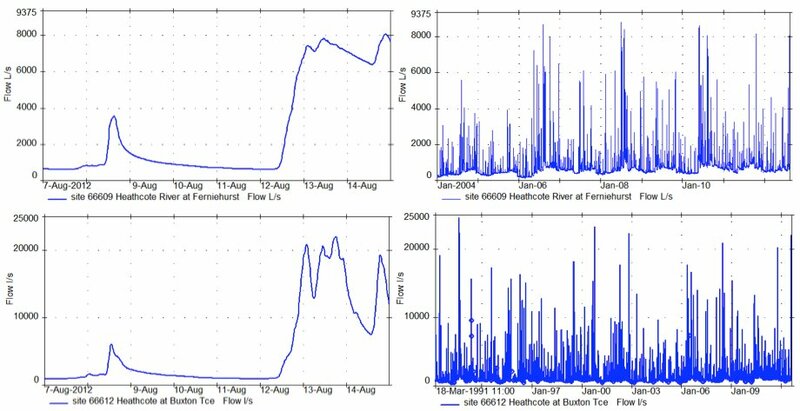 The hydrographs below (data thanks to CCC and ECan) show how the discharge in the two Heathcote River sites rose over the over the week prior to the 14th, and how these peaks compare with historical data. Flows this high don’t last for long. For only 0.02% of the record time have flows ever been higher at Buxton. In the last 20 years, there have been five other flood peaks of this size or larger at Buxton Tce. You might have noticed that the Buxton Tce site has more than twice the peak flow of Ferniehurst, which responds quite gradually. 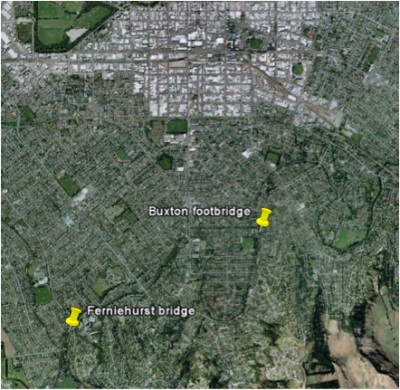 The Buxton Tce site is a few km downstream of Ferniehurst; Bowenvale Stream joins the Heathcote River between them, and is the main source of extra flood water. Bowenvale Stream drains a steep Port Hills valley that reaches up to the Summit Road and includes part of Victoria Park. Flood waters run off rapidly from the Port Hills, and cause most of the rapid rise and fall at Buxton Tce. Has the drainage of the Heathcote been altered by ground level changes that resulted from the earthquakes? I have noticed that in a number of places the stream velocity has increased due to uplifted bands of gravel creating “rapids” followed by deeper pools. This could be what the river looked like before the banks were maintained by colonial English-influenced landscape architects. The whitebaiters are getting some good runs, but in different locations from pre EQ. The slumped sections have vegetation that looks like better inanga breeding sites. The CCC has relocated new/replacement paths away from the riparian strip. It would be nice if the river could be managed back to a more natural character yet still retain flood safety. I think this would lift water quality and increase biodiversity. I would be interested to know how much water from new sub-divisions created around Halswell has contributed to the extensive flooding on the Heathcote over the last couple of weeks? I wonder if Danial Collins is still about to reply—we have a residents association made up of home owners on the Upper Heathcote River beteen Bidwell and Templetons road who are very concerned about the Fall and Fall of the Heathcote River resulting in a Toxic sludge of weeds with no water flow—we consider this a Health and Safety issue and have no satisfaction from the City Council to rectify this problem—many long term residents have never seen the springs completely closed down as they now and have experianced many a low water table in the past—-are we correct to assume the over allocation of irrigation locally has robbed the cream of the aquifers that used to always work –and is the possibilty of a controlled deep water bore around the Templetons road technically possible to re supply flowing fresh water to the Upper Heathcote and solve many of these problems.